A peasant is a peasant, is a peasant…or is s/he? Was the life of a peasant who lived in the coastal regions of England the same as that of the peasant who made his livelihood toiling on the land for his local lord? This paper given by Fordham University’s, Maryanne Kowaleski answered this question and gave insight into maritime peasant life in late medieval England. Kowaleski argues that peasant activities have been overlooked in maritime environments and this paper bridged the knowledge gap between those who lived off the land and those who lived by the sea. This paper examined ways maritime peasants earned income, outlined their duties, examined the development of a distinct peasant subculture and formation of close knit social bonds in coastal communities such as: Beetham (Cumbria), Holkam, Wells-next-to-the-Sea, Yarmouth (Norfolk), Brightlingsea, and Tollesbury (Essex). How did proximity to the sea impact peasant life? Occupations were different for coastal peasants. Maritime peasants commonly made a living as salt-makers, sailors, fishers, and fowlers and paid fines and licenses to the lord to ply their trades. Peasants could also earn an income off the collection and sale of reeds or another trade like subsistence fishing. Kowaleski noted that, ‘Eel and herring rents point over to regional resources exploited by peasant fishers’. 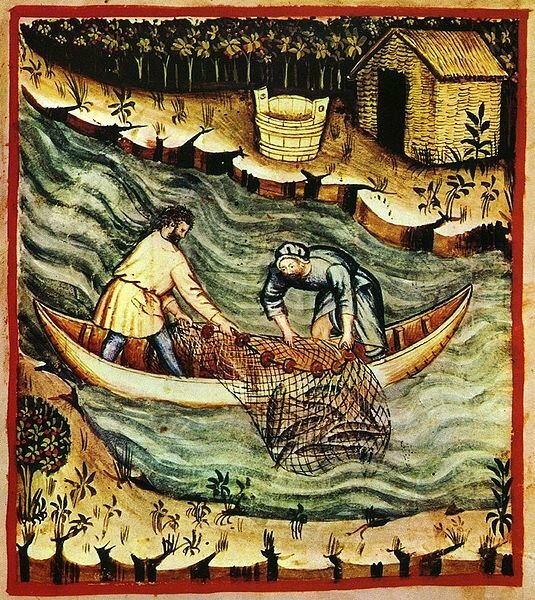 Sea oriented peasants were typically less invested in agricultural work but in essence, the lord-peasant relationships were basically the same as with their inland counterparts. Most maritime peasants were also farmers but looked to the sea to supplement their family income. Some more fortunate peasants were able to own boats, with the usual size being around twelve tonnes and most being under twenty tonnes. Peasant boat owners had a higher status than non-boat owning peasants. Service on trading vessels was another important source of income for maritime peasants. Given their sea faring activities how did they manage to serve their lords? In some instances, coastal peasants had their land service commuted. Interestingly, most ship crews in the fourteenth and fifteenth centuries were not usually locals. Rural settlements became maritime “bedroom communities” as peasants on sea service didn’t reside in larger towns and cities. Their time at sea marked them as different, and even though their relationship to the lord was the same as their inland brethren, a sea subculture did develop. Peasants took advantage of wrecks as “first finders” and enjoyed the spoils with their local lord. However, they also took advantage of salvage operations by secreting objects and feigning ignorance so they could hawk the ill gotten goods later. Wreck salvagers were almost exclusively young men as it appeared to be a dangerous activity that discouraged women and older men from participating. Fines for pillaging wrecks were often levied against entire gangs of men. Wrecks were most frequent around Cornwall and to this day, it remains the most notorious site of ship wrecks in England. Crew service on trading vessels routinely had peasants away from home. Many worked on wine ships to Gascony, and coastal ships on long haul fishing journeys. Some villages sent out as many as nine to ten ships per year, but the majority sent only two to three. Fishing seasons lasted from one to three months. This type of arduous labour, and long periods away from home helped foster a common cultural identity amongst maritime peasants. A mutual solidarity also developed amongst fishermen, Kowaleski stated, “In the age before steam, sailors had to deal with extreme uncertainties, and risks.” There was risk due to Anglo-Hanseatic conflicts, resentful locals and marauding pirates. Fishermen developed a variety of strategies to combat these problems. One of the ways to do this was to recruit kin and maintain a family ownership of boats. This strategy ensured a steady supply of seasonal labour and lessened the psychological stressors inherent when being forced to reside with strangers in close quarters. Another strategy was the implementation of a shared system of profit distribution. Profits from the sale of fish were divided up with the largest profits going to the owner of the boat. Fishermen then received equal shares of the catch. This promoted solidarity by fostering a shared purpose and goal. It also prompted more egalitarian relationships and helped mitigate the constant dangers they faced at sea. In Eastern England, another fixed portion was given to the local lord, known as a “town dole”, and the vicar also received a “Christ share”. “In the fifteenth and sixteenth centuries, Devon and Cornwall saw an expansion of coastal and deep sea fishing, a growing investment in fish curing and processing, and a growth of off shore settlements from seasonal to permanent”. In spite of this growth, maritime peasants continued to farm. Due to the high risk of life at sea, the demographics show that in Early Modern England there were more women in maritime communities versus land based ones. Kowaleski stated that maritime women had more autonomy and agency because of the essential role they played in fishing ventures. All fishing communities faced dangers from enemy raids during times of war, storms and flooding. Up until the Black Death, Eastern England suffered from bouts of flooding. Coastal communities built stretches of walls and sea dykes to mitigate this problem. Peasants also formed cooperative institutions to regulate sea defences, they formed special courts, had their own officials, and levied fines to enforce responsibilities to further the “communal good”.